This update brings two brand new modules which will allow you to create almost any type of post type slider (including blog posts) easy. This update added a new slide type “Content/Custom” which will allow you to create basic sliders easily and directly within slider module as opposed to creating & saving layouts first. Those are just a few use cases, there is a lot more you can create using Anything Slider plugin. Starter kit library is a growing library where you will find starter layout packs which you can download and import to your divi library right away to get started with your website creation even faster with anything slider plugin. When you purchase this product a License key will be generated and shown in your EMP account, please copy that and once the plugin is installed and activated go to Plugins > Anything Slider page and insert your License key and save it. This is a really important step so you get future updates notification right in your WordPress dashboard and it can be updated directly from there. Is there a way on the Anything slider to have the content continuously move instead of ticking? 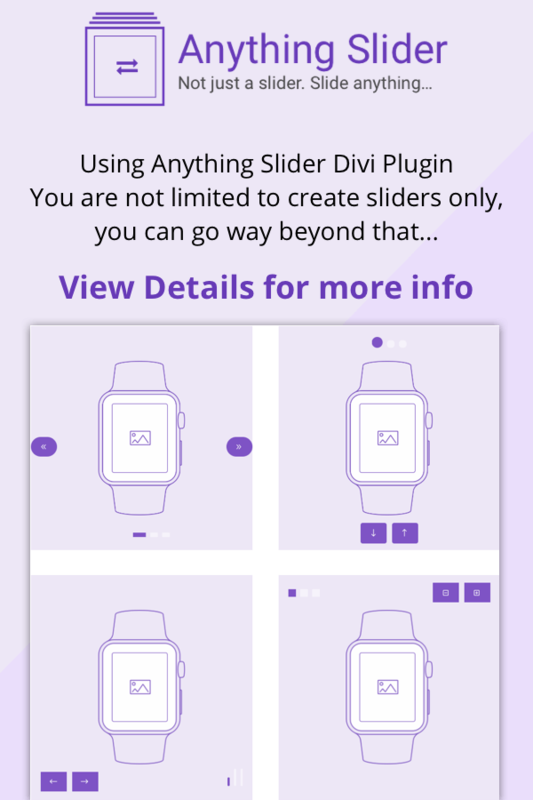 Is Anything Slider compatible with The Latest Divi Builder Experience in Divi Builder 2.19 and WP 5.0 ? For all views or are there some issues? or restrictions? Hello there. I have a question please. Is there a demo to see the plugin working in mobile? Thank you much. Cheers. You can checkout all the demos here. Alsoc heckout the layout packs. Most are basic optimized for mobile. You will have all the controls/options Divi itself provide for modules to optimize it for mobile, and additionally slider module has the mobile optimization options as well for different stuff. Hello there. I have a question please. Is there a demo to see the plugin working in mobile? Thank you much. Yes, you can use image/icon both. Is anyone still providing support for this plugin? I opened a ticket and also tried to contact via FB. No response. I’m having an issue with custom color buttons. They worked fine until i also configured the general buttons’ color. Now all the custom buttons have the frame of the general button color. We have connected with the vendor for this product – please also check your spam folder for any messages. Yes, the product is fully active and supported, it’s just that we are having Eid holidays this week and thus the support is a little bit slow only this week. I have responded to your ticket. So and now a big thanks to the producer on this extension! 4th of July is over, he discount gone and both of my contact requests are not answered. Thx a lot for that. Thanks for your comments. I am not sure I understand where you are going with the long comment but I will read it again to see what it is you actually mean. As to the 4th of July sale., It was until Midnight EST as we are a US Based company. It was an answer on “Antony Warhurst” question about an lifetime subscription of your product. It maybe is one of the first comments on here. Yes, I was hoping to get an answer on my two contact notes I wrote on contact form and support form. With this info I had bought the plugin but now I will produce this function at my own. Thx for getting back here -> also to munir. I think the other long comment is a sort of general opinion about the ecosystem, and Andrew would be best to answer that. Regarding your contact request I can see a support query 10hrs ago which has been replied now. I purchased Anything Slider earlier this week, put in a Support ticket issues I’m having in creating a carousel trying both the Divi Layout & Custom Content methods, but have been waiting over 4 days now for a further response (after an initial one from Sam). I invested in the 5 site license for $50 so hope I won’t regret doing so. I just checked the ticket #314, I can see you got two responses with instructions, and your last response was not yet replied due to the weekend. I have just replied to your last response. Let’s follow up there. I’ve been using the Anything Slider on a few of my sites and loving how you can show lots of information without making the page a super long page you have to scroll through. Here are a couple sites I’ve used it on if you’re interested. I am using Divi and I have lot of Divi sites. I am interested in working with the TAB LAYOUT PACK 2 (http://demo.cakewp.com/anythingslider/layout-packs/). a) For this to work out, do I need to buy a license. b) I am seeing lot of negative comments on the plugin not working. As I said earlier, I am working with Divi, hence, I assume it works with Divi Theme. Yes, it is a Divi plugin so it works with Divi, actually only with Divi. a) Yes you will need to buy a license. b) Not sure where you see lots of negative comments? I think I answer all comments, so that must have my answer as well. c) No trial license available. Note: Like any other 3rd party plugin, it currently only works with Divi back-end builder and not the visual builder. -the module anything slider does not work . I can create it and set it up but when I close it, it’s impossible to open it again to edit! Are you trying to use it on the visual builder? Or Back-end builder? Could you please open a support ticket and I will be there to help you. Love the plugin! I am trying to use the sliders to display 5-6 YouTube playlists. Here’s a few issues I’ve seen. 1. The videos won’t center in the browser. They are all left-aligned. 2. The weight of the font keeps reverting back to regular, even after saved as bold or semi-bold. 3. This is the biggest issue, but none of my YouTube playlists are loading on mobile. I see the slider menus, but nothing loads. Could you please open a support ticket and I will follow up on your issues there? i’ve purchased the plugin and i am using it with a number of slider per screen = 3. The problem is that in mobile view i still see 3 slides in the view, it seams like it is not responsive. Is it correct? You can adjust the number of sliders differently for Mobile & Tablet from the same control. Click on the small mobile icon and adjust the numbers per device. If you need any assistance please contact for support “www.cakewp.com/support” and I will guide you. first of all i wish you all the best for 2018! I ask a while ago, If i add a section with animated objects (section, row, module) to a slide, the transition is only done once. How can i set to load the content again. Can you tell me when the feature will be available in the plugin? I would need it for a project of a customer. Sorry I missed your comment. I didn’t receive any notification email for this somehow (Andrew?). I kept my promise 🙂 It’s done now. Update to v1.5 and you will be able to use divi animations on any module/content you add to a slide via divi library. It should work now. Let me know if you got any feedback or Suggestions. Hi Munir, i found out that it works now fine with animated rows, but unfortunately not with modules. It should work with modules too. Please open a support ticket at cakewp.com/support and provide me with the URL and specific details. I will follow up with you there. Is it possible to put an image slider inside a tab along with text? For example, could you have an image slider floating left and have text flowing around it all on one tab? Sorry for late response, somehow I missed the notification for this comment (or I didn’t receive any notification). Although I do not understand what you mentioned, Slider within slider will cause issues. If you meant to add Anything Slider to Divi Tab’s module, that could also not be straightforward but possible. Sorry that you are facing trouble activating the plugin. This is due to the reason your server must be using an older PHP version this is actually not good as well for security reasons to use that old PHP version. Please contact your hosts and request to upgrade (or if you have a cPanel that lets you select your PHP version select 5.6 or later) and your issues will be resolved. You will, ALSO, enjoy the security and performance benefits of a supported version of PHP! If you have upgraded the PHP version and you still see the same error this may be because your instance of WordPress is still using old PHP version, in this case you will also need to drop a phpinfo.php file into the directory where the website resides and then run it, you may also explain this to your hosting support and they will do it for you. If you still get the error please open a support ticket at cakewp.com/support and I will follow up on your issue. If I buy a license for Unlimited sites, for $120, am I required to renew this every year? This is not made clear. Yes, you need to renew each year to receive updates & support. what’s the best way to update from version 1.1. to 1.2? Hi, we are trying to do a really simple slider within a custom post type. Just pictures. Do you have to create a separate layout for each photo? Where do you do this? I am a beginner. The developer set up an anything slider because we wanted the photo to span the page rather than being on the side of a placeholder for text that comes with the standard divi slider. Yes! Each slide either it’s simple photo or a complex layout should be added separately, you need to first create and save all slides in Divi layouts, and then from the Anything Slider module, you may select those slides. But I am exploring other ways to make this process much easier for simpler sliders like this, may not commit anything on this just yet though. Hi there – this is a pre-purchase question, will Anything Slider allow me to use it as a background to a custom built footer, ie a standard section with two columns containing blurbs and contact forms and then having an automatic image slider in the background of that section? The short answer would be YES, but there is no option to make it happen with a click. You may achieve it through with tricks. Like one way of doing it would be creating the Custom footer with a section with 2 rows. To row will have the slider and the bottom row will be your current footer setup. Now you may make the bottom row position absolute so that it will come on top of the first row (make sure the section has position relative). Then you need to adjust any CSS things and it may work. I may, however, think about making it little easier with some option in future, I have noted it. Great plugin. Is it possible to set that plugin to work with graphics as carousel in loop? The CSS for Next & Previous button selectors doesn’t seem to have the right font size so I end up with 2 different size icons. The font sizes also include the !important rule making it hard/impossible to override the font size manually with CSS! The website i’m testing it on is http://demos.michaelhabib.name/wordpress/wp-demo1/one-pager-tile-shop-homepage/ & would love some advice. On your test page, both icons look equal size and the font-size is set to 40px for both when I test it in just now. Am I missing something? Please open a support ticket and let’s resolve this for you. Is there any to use the Carousel function but not have the URL changing when the Carousel changes? YES. you will be able to disable the HashURL in the next update I am working on. Expecting to release it this Monday hopefully. Very good stuff! I have a question, is there a way to add a image gallery with CTA inside a Tab?with anything slider? YES, basically the slides here are your saved divi layouts, and you are free to put anything ( unless a conflict and no slider within the slide) in your slide which you can add via divi modules or shortcodes, Divi’s default gallery module should work perfectly here. No need for any extra plugin unless you need it for a purpose. Hi, I am having issues with the plugin. My site crashes and is very slow when installed. I deactivated all plugins except “Anything Slider” and it still crashed and was very slow. Once I deactivated “Anything Slider” and activated all other plugins my site was working fine. I am using DIVI Version: 3.0.51 and there is an update available to 3.0.82 but I don’t have control of my theme update. My web guy controls that. Is that the issue as I’m not using the latest update? I apologize for the late response, somehow I missed this comment notification. This should not happen because of Anything Slider plugin, there may be some other issue I assume. I request you to please head over to my support page (http://cakewp.com/support) and open a ticket providing these details and possibly a temporary admin access to me (munir@cakewp.com) and I will look into this for you. Hi, if i add a section with animated objects (section, row, module) to a slide, the transition is only done once. How can i set to load the content again. Yes the divi animations on content basically runs on page load, and technically all the slides loads on page load they are just hidden so animation on each object runs behind the scene. This is how it works. Although i am looking for a solution to make it run when the slide is in viewpoint. This is something on the plate still, I push an update with awesome new features earlier v1.2 and also another update v1.3 is also almost ready with more new features, after that, I will definitely look into this feature as it’s already noted and on the feature request list. I am sorry for the trouble, not sure how I missed your email, I still can’t see it. Anyway, this is actually not an error but a PHP notice seems like you have turned on the debug mood which shows these notices. I am already working on an update and will handle this more efficiently in that. Nice plugin, but what about its responsive design ? When I check your demo, it doesn’t seem to be optimized. Anything slider is itself responsive, however as each slide is a divi layout thus it’s responsiveness is to be adjusted as you normally do on a divi page. On the demo, most are optimized, but yes there are a few not optimized properly. Hope it makes it clear? this script from your plugin has dropped our page speed because it is render blocking, but if I inline & defer, the anything slider module no longer works. Any Suggestions? Yes there is currently no active class added by default to fist menu item, this is because the active class applied onClick function. I will look into possible solution for this and will try to implement it in an update. I don’t have an idea where to start. Thanks! Hi there – as far as I can tell I have completed the assembly of an Anything Slider from scratch following the videos from the site. I have added 3 slides to the Divi Library and I can see them just fine. I have added the AS module to a new page and subsequently added the 3 new slides from the library dropdown list. I was trying to create an accordion slider but even on the basic settings I can not see anything. When I check the Inspector I can’t see any evidence of anything slider in the entries. I thought it might be the autoptimise cache, but even when emptied I can see nothing….. help!!!! First of all apologize for late response, somehow i missed this comment. Also, how much are updates after the 1 year time frame? Will the plugin continue working if we don’t extend the license after the year? could this plugin be used with logos to yield the same effect as this plugin? Any idea what’s causing that? I was hoping to use this plugin on a site that launches in just a few days. I have replied you via email. Please followup there. I have the same problem. Can you please publicly post a solution instead of sending emails to everyone ? The reason to reply via email is to follow up through proper support channel, as these comments here are not for support. As these support queries needs multiple replies and followup as you may understand and this is not manageable here via comments. I will be there to assist you properly with any issue. I am trying to put a flip box in the anything slider. Limited success with that. It seems that with the back/forward controls on the page the flip box on the right side won’t flip till it moves to the left side. If you disable the b/f controls and turn on auto slide and if you are flipping a box when it is time to slide the slide now stops and won’t work anymore. It’s like the control areas for the slide control and the flip box overlap and cancel each other out. Also I still can’t get flip box to have a different front color than the back, in fact I can’t get it to show a back color without the front color being on then it just shows the front color on both the front and back with or without being involved with the anything slider. Another thing with the flip box under Design there are two Select Layout – both of them say “Here you can choose layout for the frontend.” only the top has any effect and it’s on just one side of the card, the other one does nothing. Same with padding and margins it seems to only effect the front sided of the flip box not both sides. Does anyone have any good documentation for these plugins? First part of your comment is related to Anything Slider which i will be able to help you with and i would request the page link here as well to review and debug this. The second part where you mention issues with some ‘Flip Box’, i would request you to post that to the relevant product’s post so they can assist you with that. I purchased Anything slider and tried the Ebook-Layout. None of them worked I got the following error. “A script on this page may be busy, or it may have stopped responding. You can stop the script now, open the script in the debugger, or let the script continue. Does this mean I have another script that is incompatible with this one? Anyway to tell whats going wrong? The Testimonial pack, style 1.json seemed to work just fine, still playing around with Anything slider. The link is not complete, seems broken. Could you please provide me the page link where you have used Anything Slider module and having this issue, so i can debug it further. I get the slider working when starting from scratch. The problem that I now encounter is that upon first pressing the menu or the dots the text gets scrambled. Only the first time, next it works well. Please make sure you use some animation except ‘off’ on the slide in and slide out animation. And also your menu ids seems still wrong to me. Please contact me via contact form link as provided in earlier comment and i can better assist you with this. You need to update the urls as explained in an instruction video on the documentation page and here is the direct link for you a well. Pre-sale question. Due to the strict no refund policy, I’m apprehensive to purchase the unlimited license until I have tested this plugin. My questions is, if I purchase the single site license and all is well, can i upgrade to unlimited site license and just pay the difference ($90) if I decide to upgrade with a reasonable amount of time (say 5 days) ? I design many divi sites and manage 14 Divi sites currently. I have had many issues with my Divi plugins and compatibility issues lately, so it is absolutely necessary for me to be able to test this plugin, before committing to unlimited site license. Of course when I say test, I mean purchasing the single site license before purchasing unlimited license. Sorry for late response i missed this comment somehow. Yes you can upgrade later by paying the difference between plans you are upgrading to. I have serious troubles with the anything slider I am setting it up as tabs for content as you suggested but the content overlaps and the menu doesn’t always go back to the right location. It’s like its Z index is wrong or something is overlapping something else. I cannot figure this out. My test site is here https://cwssoft.wpengine.com and I’d love support today if possible. I’m wondering how to make the button “Grow Your Ministry” default colored in. Right now it’s like both buttons are in the “off” position, even though it’s showing the “Grow Your Ministry” side by default. If you click on “Grow Your Students” it will turn that button bright green, or if you click “Grow Your Ministry” it will turn that button bright green. But how do I default it to be bright green on the side it default loads first? Nevermind, I decided to do something different. Thanks! Great plugin!!! But I’m struggling to customise the Starter Kit layouts and add more menu items, etc. I’ve followed your instructions but still can’t link the slides to the menu. I’m sure I’m not doing it right. Would be great if you had an instruction video where you actually talk through the entire process as it’s hard to read and follow along in step by step mode, going back and forth. I’m also finding that even though I change the slide URL in the AS Menu Module Settings so they each 5 tabs have different slide, I’m ending up with exactly the same content in all 5 tabs. Can you let me know what I’m not doing right? Basically you need to update your menu links after the layout import to make it work. There was a video on the documentation page at the bottom for that, but i have recorded another video where i talk on this rather than just music, hoping this would make it pretty more clear. Please contact me if you still unable to make it work, i will help you out. Hi there – just bought the plugin and I’m trying to create interactive section. I downloaded the layout from your library, but am not sure how I link the ‘See Features’ button to the next slide. I don’t see anything about that in the documentation. Thanks in advance for your help! Please check my response to your support email and let’s followup there. I just purchased a lifetime license of Anything Slider. I have watched all tutorials and read all documentation but still am not able to get the slider to work. I am using Divi of course, everything is up to date along with latest version of WP. The issue is when I add a slide inside the Anything slider module, I do not see the new Divi Library Layout I have created from the new slider pull down menu. Can you offer any suggestions on where to begin troubleshooting this? I have created over 10 sets of different Divi Library items, from layouts, modules, sections, etc. Hoping there was an issue of the type of Divi Library item, but none becomes an option from the Anything Slider pull-down when adding a new Slide. I have replied to your support email. Please check email and let’s follow up there. Thanks, Munir, Issue solved. Again, thanks for the VERY Quick response. If any other developers are reading this, Munir solved this issue within 15 minutes, maybe less. My company, WebWize has been building websites for over 23 years, and to have this type of quick and successful support is rare. High-Five to CakeWP! Good Job! Thank you so much for the kind words Glenn, was lucky to solve this that quick. For anyone else not able to see the saved layouts in the layout picker dropdown while adding slides using Anything Slider module as reported by Glenn, please follow these steps. This is a temporary solution until next update which will hopefully fix this. Go to Settings > Module Extender and check on the checkbox there and click on Save changes. Done. You should now see the layouts fine. I know this is not ideal but just a temporary fix until next update. Where is the option for the “Lifetime” license? There is no option for lifetime license on this product as updates for a great user experience will be many and often. This plugin looks great. The issue I have is with the new licensing model you are introducing. Having to pay an annual license to receive plugin updates will make this (and other) plugins less attractive as part of a client project and will make client conversions harder. Is there a way you can look at reintroducing a developer lifetime licensing model for all plugins? Well done to the developer of this slider, looks great and has some fantastic features. 5* Although I will be waiting to see if there is a lifetime licensing model before buying. Hi Anthony, licensing will always be an issue in the WordPress community and we absolutely get that. We are developers ourselves and dislike paying what can be perceived as over the top for plugins. The developer not only works hard maintaining his products but also, adds to them with the use of layouts and extra’s as well to make using the plugin easier. With all the changes in Divi Theme over the past few months, developers have found it taxing to say the least to keep up with them and must always be on hand to make sure everything works as it should. This licensing model helps that task immensely. thanks for getting back to me so quickly. I understand that a developer has to maintain, enhance and deal with Divi changes and I can only imagine it is a nightmare at times. It’s just that annual plugin licences are always hard to sell to clients, unless they can see value directly added to their business (not that many seem to realise that their lovely new website is doing this). Perhaps an option would be to charge more for an unlimited developers license for the initial year, but then offer a discount for subsequent years? Just a thought. Having said all this I think this is one of those very rare “Super” plugins that does the job of many other Divi plugins (and some parts of Divi itself) and would be a great addition to everyone’s Divi toolkit. Very well done. Thanks Anthony, we are working on a discounted renewal model for sure. – Security -> Your customer is having a computer and using software on it? To get updates the software is licensed and she/he have to buy another licenses to proceed with the software? The same as on online projects. The most people are of opinion that CMS, Blogs and Shopsystem don’t have to cost anything and all the great extensions are free to use, but you have to sell a product -> an living product As I wrote in the last sentence, its necessary to not make a one-timer on a good job. You want a long term relationship with your customers and how can it be better to have a recurring bill every year or half year? I started early 2000 parallel to webdesign with my own servers and additionally domain-reselling. That was the first customer binding I have done. The next step was to give out an “Update-Service” for CMS and Shop-Systems. All of my customers loved it, they have nothing more to do than do their own job/stuff and I do the rest. Next step was to look for fast, technical perfect and friendly producers of extensions and in rare cases producers of free extensions. You want support, a feature rich basis and a bug free experience … and all of it free? A lifetime thing is a free thing for me. Its as I wrote before, its a living product and not a finished something that you can put into your shelf and hope that the producer is getting lucky with it. Its a one-time payment and when there are not enough buyers of this product the producer will have to shut down the production sooner or later. This is a market place and all of the producers have to fight against each other to get found by the visitors. E. G. Divi is a Theme-Producer for many years and before they invented a developer subscription they sold everything with normal subscription licenses. There are more and more web developers out there which are running into Divi Builder and this is why they made a “fix”-price model. But as I wrote, this is an marketplace and another situation. Overthink your question and sell your stuff as subscriptions, too. The customers will also be happy when you friendly and technically not to be overestimated describe why such a thing costs. Put the costs of an extension not inside the total price, put it as an extra option inside your offer. Just the installation and adjustments have to be inside your total price. Another thing is -> I’m selling webspace to many customers right now and the most problems with hacked systems are free extensions (ore those one-timers from codecanyon which will be closed after a few weeks) and this not only in for wordpress. Joomla, Drupal, Typo3, Contao… all of them. Get your stuff ready and make your customers happy! Improved: Divi Animations work on each slide now. NEW: Two completely new modules added which will allow the user to create any CPT slider with the ability to puzzle slide layout in any way a user wants using the provided CPT Elements module. This update opens up a bunch of new possibilities you can use Anything Slider plugin. FIX: Some bug fixes to AS module. Improved: Some under the hood improvements to AS module. NEW: Disable Next/Previous Labels Option. NEW: Slide Type option to choose between Layout or Custom/Content. Now making basic sliders, even complex are much easier than before. NEW: Slide Image with the bunch of dependent options to style it. NEW: Slide Content with the bunch of dependent options to style it. NEW: Two Buttons can be added now bellow content for content slides. FIX: Image Top alignment for builtin NavMenu control. FIX: Other bugs fixes & code improvement. NEW: Built-in Nav Menu Control which also syncs on auto. NEW: Custom IDs/URL made possible. NEW: Option to disable ID/URL. NEW: Option to enable RTL Support, this will make the slider work in RTL websites. NEW: Slideby Option added to specify how many slides to skip on each rotates in carousel mode. Improved: Some controls type changed from text to range for better user experience. Improved: Better organization of controls. Improved: Next/Previous control disabled state. Fixed: AutoHeight Issue where images got cut off from the bottom. Fixed: Few Bugs and code cleanup. Fixed: Auto update functionality, now from the next time user will be able to update from WP dashboard directly. Fixed: Slider OFF animation, this will now make slider slide in left/right direction. You may install this product on the number of websites for which you have purchased the license, that you build for yourself or your clients. You will receive 1 year of support & updates – premium support charges may be incurred after this period. Please be aware that you will need an amount of experience in Divi Theme and WordPress to take advantage of our themes and plugins. Please make your decision to purchase based upon your skill level to see if our products fit your needs. Due to the nature of Digital Downloads. Refunds are completely at our discretion. This product uses two Opensource libraries and all the credits and license information are mentioned in the file LICENSE.md in the plugin folder.